Actually got this news a few days ago and wanted to share. Thank you so much! 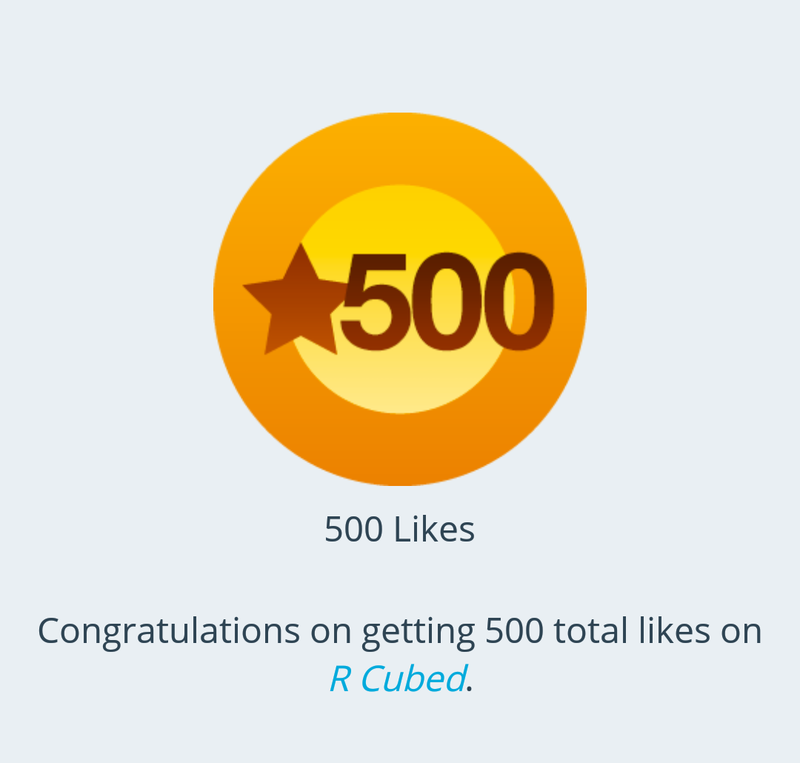 I appreciate the visits and follows and look forward to doubling the likes in the future. If there’s one thing that adds to the geek aesthetic of Comic Con, it’s the cosplay. A combination of the words “costume” and “play”, cosplay are basically the costumes that one would see roaming inside and outside the Convention Center during the event. They range anywhere from popular TV or movie characters to ones from Japanese anime. The possibilities are endless when it comes to cosplay. Here’s a few photos of myself and other attendees who decided to dress for the occasion. In 2010, I was Tifa Lockhart from Final Fantasy VII. Although a pretty simple costume, it was made out of faux leather material, which would get HOT while walking outside. It wasn’t one of the more familiar costumes. Heck, you wouldn’t really know about it unless you played their video games! But I did get noticed a few times, which was cool. I also dressed up as Lara Croft from Tomb Raider. Another simple costume, and the gun holsters were just badass! I had to get the guns checked before heading inside the exhibit hall. That same year, a friend of mine dressed up as Michael Jackson in honor of him passing away the month before. Although he was nervous about it, my other friends and I told him it would be awesome if he did. Sure enough, he was stopped every few minutes to take a photo. I had to laugh because he didn’t practice his moves and someone challenged him to a dance off. Who is The King of Pop without the dancing?! Before watching panels in Hall H that morning, another person dressed as MJ’s character in Captain EO took a picture with him. That same guy has worn it every year following. Despite a few tweaks here and there, that costume is practically timeless (well, to those of us who know about Captain EO, that is. 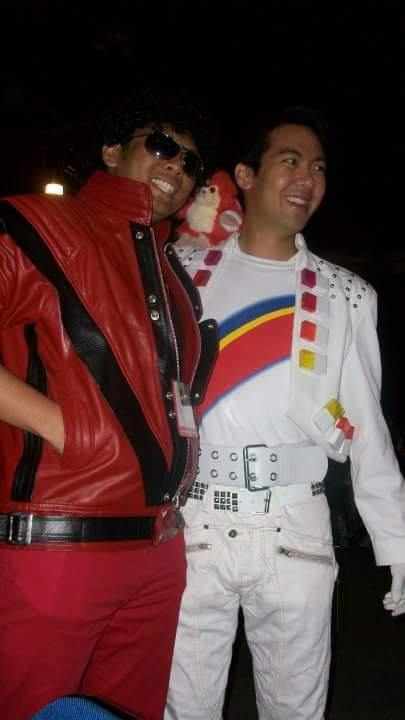 My friend as MJ from Thriller with his character from Captain EO. In the following years, I’ve gone again as Tifa, and also Maka from Soul Eater. The latter is still my most popular costume to date. I’m still amazed at how many people actually watched that show. Then again, it’s difficult not to notice someone walking around carrying a scythe. Just sayin’. I even ran into some well known cosplayers that I’ve seen on social media. Vampy just happened to be giving away pins while on the exhibit floor one day, so I was able to meet her and catch a quick photo before she was on her way. She’s come a long way in developing her costumes, but her Lady Punisher is still one of my favorites. Vampy strikes a post with a fellow cosplayer. 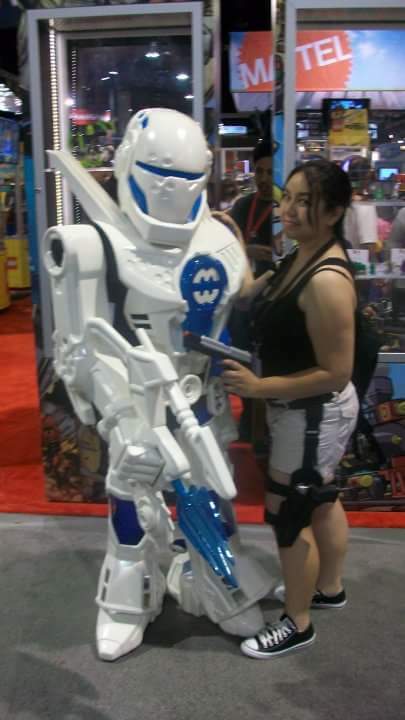 Here’s a few more photos I got during past SD Comic Cons. Aside from those kinds of cosplay, some focused on pop culture. As I mentioned earlier, there really is no limit to what people end up wearing at Comic Con. Deadmau5, is that really you (of course, it wasn’t)?! One half of Daft Punk. The one with the gold helmet was behind them. I’m currently in the finishing stages with the one I’ll be wearing this year. I don’t plan on throwing many hints out there about it, but I will be sure to include the full get up in a future post. 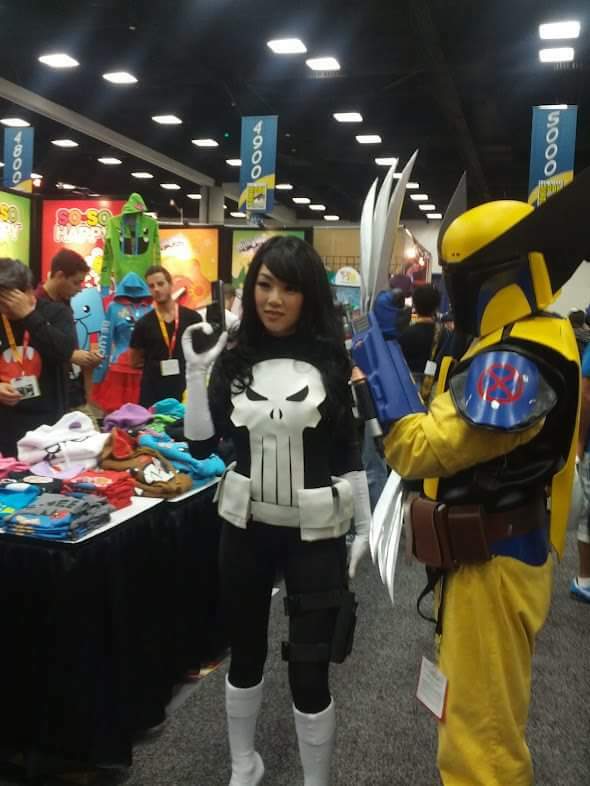 Cosplay, whether it be creative or casual, is an absolute fun factor of SDCC. I can’t wait to see what people come up with for this year. I’m going to cap off this post with a photo of an awesome battle pose I randomly caught before heading out of the convention center for the day. 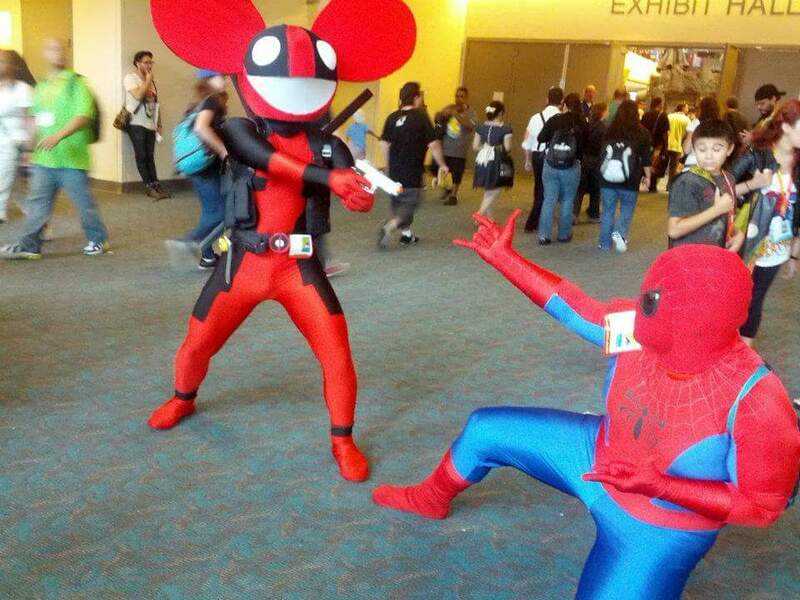 Superman and Dead(pool)mau5 duke it out. If you’ve been to events like this or similar to it in the past, what kind of cosplays caught your attention? Feel free to share in the comments. I’ve been nominated by LancoraPerla for this award. Thanks very much for the honor! What are the top 3 things on your bucket list? Visit Australia (been kind of obsessed with it since meeting so many bloggers from there. Looks like a lovely place! ), relocate somewhere for at least a year, be it for school or otherwise, and eventually have a family (meaning husband and kids). Which beauty product can you not live without? A good lip balm. What’s your favorite song? Too many to choose from, really! But I’ll say Billie Jean by Michael Jackson is one of my top 5 of all time. What’s the most important quality you look for in a partner? Honesty. I have no problem with a person being real, even if I may not like what they have to say. Name a color that describes your personality? Silver. I’m sure most of you have heard of the phrase “every cloud has a silver lining”. I chose that color because I prefer to look for the positive aspects in everything. What aspect of your appearance do you love the most? My smile. Thanks mom for the braces during middle school. They were worth it! Describe your favorite outfit. T-shirt, jeans, and a pair of low black Chuck Taylors. Why did you decide to start blogging? I jumped on the blog train at first because I had friends who had accounts on Xanga during college. It was an outlet of expression, and it still is once in a while. Where do you see yourself in 5 years? Hopefully working full time and living a great life with my family. 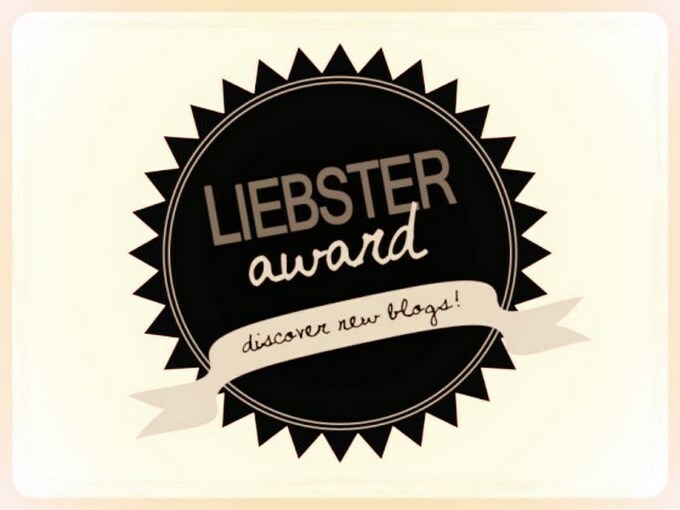 It took me a while to try to find bloggers who haven’t been nominated for this, so apologies if you have. 1. What are your plans for the summer, if any? 3. What was one beauty product you didn’t mind splurging on? If you haven’t done so yet, what would you splurge on? 4. You’re offered an all expense paid trip to anywhere in the world. Where would you go? 5. Did you ever try a beauty regimen that you found unusual? If so, how were the results? 6. Who’s your celebrity crush? 7. What’s the inspiration behind your blog? 9. What’s a good food place from where you live that you’d recommend? 10. How often do you check WordPress? I’ve disappointed myself in the past by missing a few of these boxes from my absolute favorite place to shop (seriously, I’m here at least once a week). Thanks to My Subscription Addiction for giving me a heads up on this one! Cutex Advanced Revival Nail Polish Remover Pads – I used one of these to remove my old polish before trying out the one provided in the box. It removed it quickly, and 1 pad is saturated enough to use on all 10 nails. Great to use for travel. Fekkai Pre-Soleil Hair Mist – Shake the bottle to combine the ingredients before spraying on hair. It contains a UV filter and sunflower seed oil to help protect hair against frizz, color fade, and dryness while adding shine. It has a light citrus scent, which I like. I don’t apply do much of this near my roots for fear of the greasies, but I do concentrate it a bit more on my ends. This will come in handy for more frequent use once I color my hair. 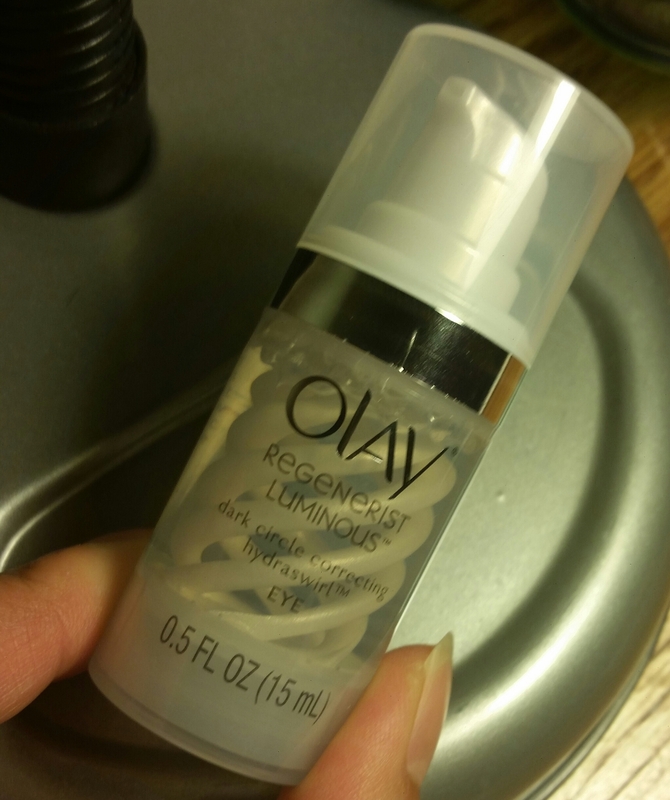 Olay Regenerist Luminous HydraSwirl Eye Cream – I haven’t been very much into eye cream and don’t use it much. But after seeing this, I was intrigued. I happened to be pretty tired when I first applied it, and it actually made me look more awake. The product’s swirled formula helps to brighten the eye area and reduce the appearance of dark circles. I wouldn’t say the circles under my eyes are really that dark, but I’ll take all the help I can get if that means going through all of this! Revlon Ultra HD Lipstick – Again, I’ll stress that I’m not so much a lipstick person as I used to be. This wax-free gel formula was convincing enough to try at least once. I received the color Gladiolous, wihch is an intense red with an orange undertone. Definitely something out of my preferred shade spectrum (hello, neutral junkie here). I felt like all eyes would be on me when I wore this, but at some point during my day of running errands, I didn’t really care. It kept my lips hydrated and the color lasted at least 4 hours, even after eating. Not bad! If I did choose to buy this in the foreseeable future, I would get the Camilla shade. Testing out the Revlon lipstick from my Target beauty box today. Definitely out of bounds from my usual neutral lip! SinfulColors Professional Nail Color – I’ve been using this brand of nail color for some time now, so I’m already a fan of it. I received a bottle of Energetic Red. They should have named it Electric Red instead, because this stuff is BRIGHT! I used it on my toes and it’s lasted well over a week with barely any chipping. 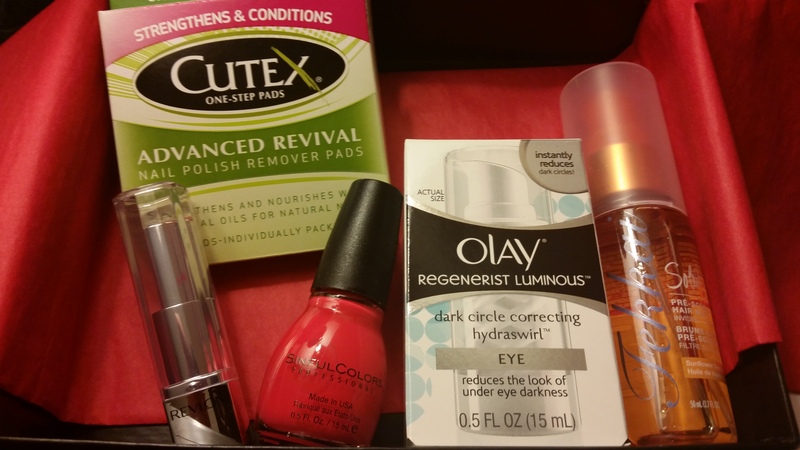 This box is valued at $40, and I only got it for under $10 with free shipping after using my Red Card. Score! It also comes with a coupon for $3 off a beauty purchase of $15 or more. This is the 3rd box I’ve purchased from them and I’ll gladly buy more if I can get to them on time. 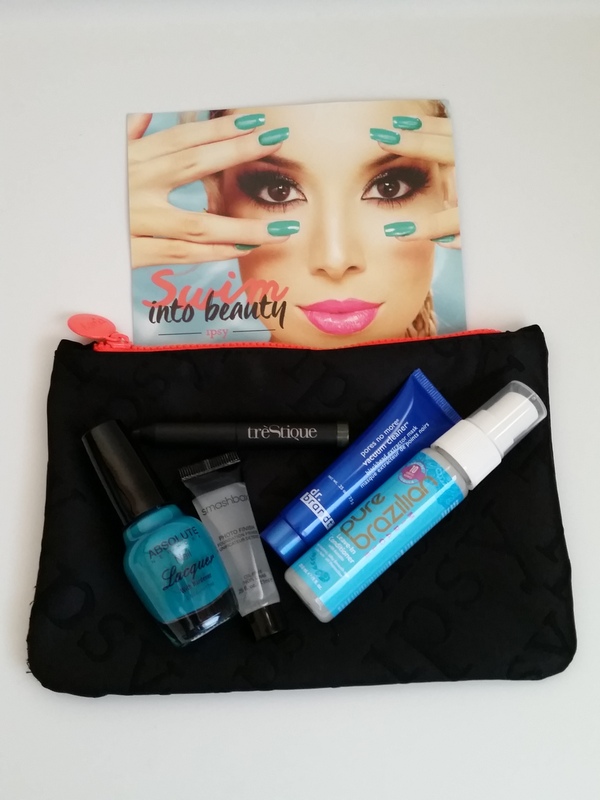 Did you also purchase this beauty box? Feel free to share your thoughts in the comments. Who else is happy that Summer is here? I sure am. This bag has some items that I would find essential for the season. 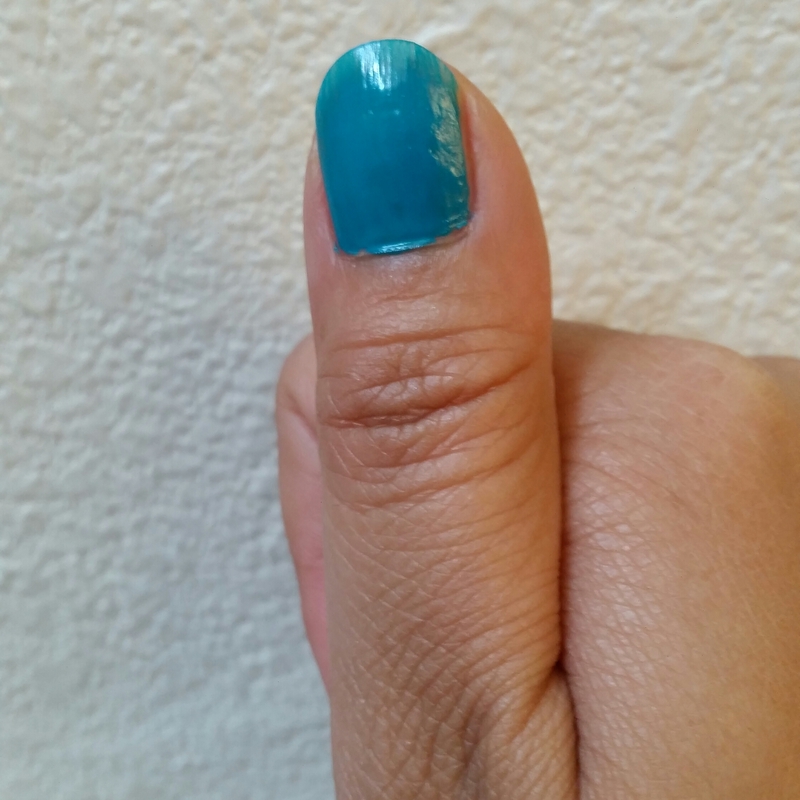 Absolute New York Nail Lacquer in Turquoise – Never heard of the brand before, but I got a great first impression of this nail color. It showed nice coverage after just 1 coat. This reminds me of the San Jose Sharks’ (my favorite hockey team) colors, so I’ll be using this well beyond the summer months. Not bad for 1 coat. Dr. Brandt Skincare Pores No More Vacuum Cleaner – A face masks that loosens and extracts blackheads? Where has this been all my life?! You can actually “feel” this working due to a cooling then tightening sensation. The mask goes on clear at first, then dries light blue. My pores were noticeably smaller after using it, and they’ve actually stayed that way. I’ll definitely be using this until it’s empty. Pure Brazilian Miracle Leave-In Conditioner – Infused with keratin, this conditioner is said to help hydrate hair and repair damage. I’ve only used it twice and haven’t seen anything more noticeable than the other leave-in I already have. The scent is a bit strong, but disappears a bit afterward. 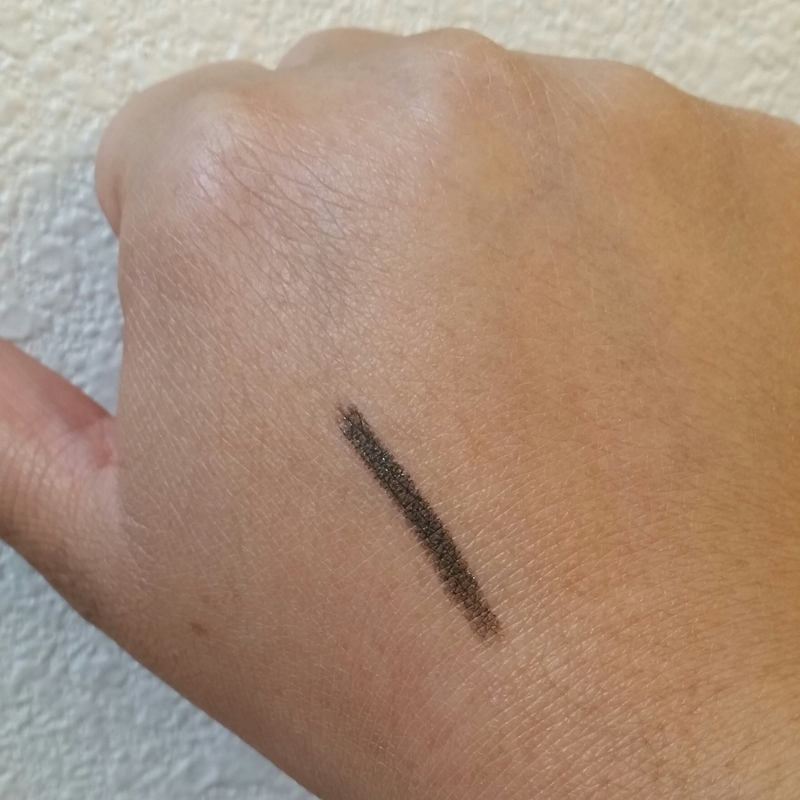 Smashbox Cosmetics Photo Finish Foundation Primer – It was nice to get a hold of this product in my bag. I’ve used it before from a much smaller tube and loved the results. One of my top high end primers! I’ll be using this during my trip in a few weeks. 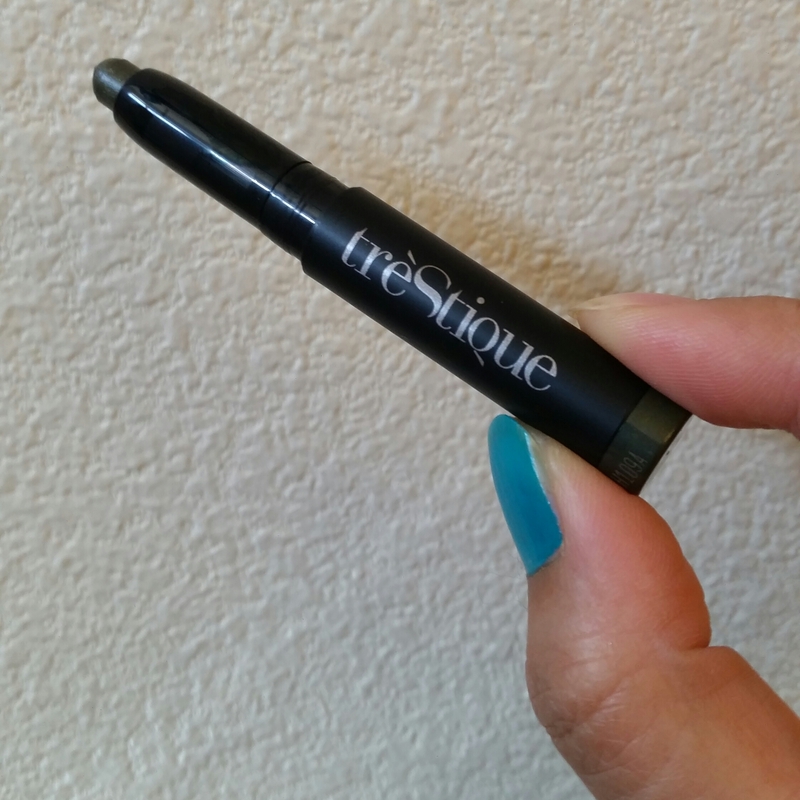 tre’StiQue Mini Shadow Crayon in Aspen Pine – I liked the olive green color of this product, as for the shadow itself, not so much. It has a little too much shimmer for my liking. I didn’t apply too much on my lids because cream shadows tend to crease on me. I’ll try it a few more times and hopefully it’ll stir me wrong. Swatched twice. Looks pretty dark, but has sheerer coverage when applied lightly. I would say I liked 4 out of the 5 items I received, but I plan to use them all up. Attend an after party with the cast of the film during SDCC. Looks like you might even meet Mr. Reedus himself. The contest ends on 06/30 at 11:50pm EST. You must be a current Time Warner Cable subscriber to qualify for entry (US only). Good luck! Thanks to Kat at The Food Blog for selecting me for this challenge. Looks like I have my work cut out for me! Write a paragraph (sounds easy, right?) without any word containing the letter “e” (still easy?). Select at least 5 bloggers to do this challenge. They must complete it within 24 hours or else it is considered as failure. Looking forward to flying down to SD for Comic Con soon. Can’t wait to buy and look at lots of toys and booths, and gawk at visitors in cosplay. I will hang out with my buds and go to off campus shindigs. Oh! Can’t dismiss grubbing on a bunch of yummy food during my trip additionally. Can I go swimming too? That also sounds fun. I won’t hold anything against you if you’re not able to do this within 24 hours. We all have lives outside of the blogosphere! I’m interested to see what you’ll write about, and maybe get a good laugh out of it. Good luck!